…it only cost her $18! You “no-sew” fans will love that she “didn’t sew one inch of it”! Wow! 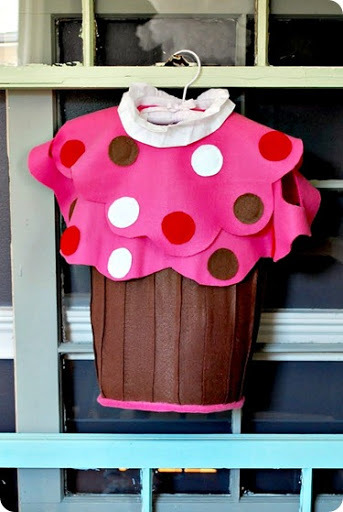 Thanks for featuring my cupcake costume! I get so many great ideas from your blog features and just feel honored! Haha, I saw a similar costume on Pottery Barn and was going to “wing it” for my daugther this year. Thanks for posting the tutorial! My daughter had a baby girl 8 months ago- and she loves to make things for her baby- but can’t sew. This is perfect for her THANK YOU SO MUCH FOR POSTING. I saw the pottery barn costume and LOVE this one so much more! !